The first thing you need to know about dog heart worms, is that they are far easier to prevent and difficult, and very expensive to cure. ...not nice, but it’s something we should all know about, here are the facts. 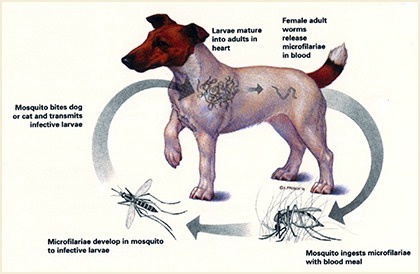 The heart worm life cycle starts when a dog is bitten by a mosquito carrying heart worm larvae, these make their way into the dog's blood stream. There are no visible signs or symptoms when the dog is first infected. After approximately 60 days from infection the larvae develops into immature worms. These worms make their way into the veins and are carried to the right ventricle of the heart and the pulmonary arteries. Once they have established themselves in the dogs blood stream they migrate to the arteries in the lungs, there they will continue to grow causing serious lung inflammation, eventually leading to heart failure. Side effects include aneurysms, blood clots and even complete blockage of some blood vessels. Within about six months of entering the dog, they mature into adult worms. A female adult worm can produce up to 5,000 live young called Microfilaria. Adults grow up to 4 - 12 inches (10 - 30cm) and can live in the dog's circulatory system for up to 5 years, upwards of 200 worms have been found in one dog. The number of worms directly affects the severity of the disease. It is only after the heart worms have spread to vital organs that symptoms are seen. The signs of heart worm infestation are shortness of breath, dry cough, general weakness and listlessness. These signs show up often after exercise with some dogs actually fainting. These symptoms may start off in a mild way so owners do not really notice. Male dogs are considerably more likely to be infected than female dogs and dogs that are housed outside are more likely to be infected than dogs sleeping inside the home. In the early stages, the first 6 to 8 weeks of heart worm infection the larvae can be treated with three different drugs, Ivermectin, Selamectin and Milbemycin these are very effective. If a dog has a positive test for heart worms then the vet will recommend an X – Ray to determine the condition of the dog's lungs, usually the destructive damage of the heart worms can be seen. It is a slow and painful treatment destroying heart worms. For a dog undergoing this treatment, it means being confined to a crate and complete rest for at least eight weeks. Over this time the vet with be administrating an arsenic based medication with injections. To kill the worms off slowly the injections are given in a variety of key spots, sometimes these develop into painful swelling. As the heart worms die they may cause a blockage in the blood vessels of the lungs which could kill the dog. Being up to date with your dog’s heart worm medication is very important, this treatment usually comes in pill form and must be given every 30 days. Some owners leave off their dogs medication during winter months, but never go over three months before restarting treatment.